Mediation is very helpful, and we do our best to help our customers reach a consensus. Contact us today! Mediation is an essential procedure that saves couples embroiled in a dispute plenty of time, money, and effort. Not all cases of mediation reach an amicable resolution and sometimes, ex-spouses and ex-partners prefer to take the long-winded legal route instead because things have deteriorated too much. But in many cases, mediation is very helpful, and we do our best to help our customers reach a consensus. -> Children, their custody, future residency, contact arrangements, child support, etc. We help reach an agreement which is not just good for both parties but also for the children concerned. Face-to-face or facilitative mediation is generally recommended by us. Face to face mediation is the norm, in which the parties to the dispute sit in front of each other while a mediator resolves the dispute and helps them reach an agreement. This method can save a lot of time, provided that both partners can handle the situation calmly and responsibly. Our professional mediators are highly skilled in guiding the parties towards a conflict resolution. We also specialise in shuttle mediation. When direct mediation between the parties either fails or is impossible due to various factors, shuttle mediation is a great technique to use. In this, both partners will be seated in separate rooms and the mediator will discuss the matter with them separately and bring the negotiation proposals from one party to the other. This might quite possibly result in a resolution, especially if the mediator is well-trained and professional like ours at Aspire Family Mediation. -> There is too much bitterness between the parties. In our experience, some couples find it next to impossible to sit in the same room without shouting down each other. It is difficult to reach an agreement in this environment, in which case we generally recommend shuttle mediation. -> There has been domestic violence. If the marriage is on the rocks because of domestic violence, it is natural that the victimised partner will feel nervous to confront the perpetrator. In such cases, shuttle mediation is not just often requested but is also recommended by us. Our mediators are sensitive and will be able to handle such cases with the care they require. 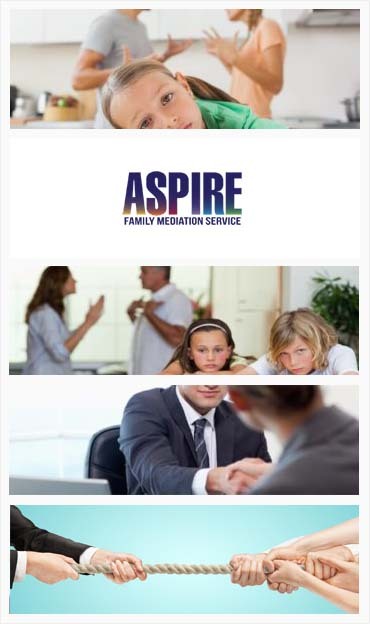 The family mediation services we provide are not restricted to spouses. We also offer mediation between parents and adult children, siblings, grandparents, and extended family members. Our focus is on making our clients comfortable and put them at their ease, point out ways for them to resolve the deadlock, and arrive at an agreement satisfactory to both parties. For this end, we aim to provide a safe mediation environment, trained professional mediators and keep the client’s non-negotiable issues in mind during the entire negotiation process. Family mediation is a practical and effective way to deal with disputes and has a high success rate. It is a good idea to try this option before resorting to lengthy legal battles.